Supersessionism refers to the belief that Christians have superseded Jews in a new covenant with God. Islam, too, sees itself as superseding all previous divine revelation but, unlike Christianity, which canonized the Old Testament embedding long centuries of pre-Christian history into the Christian narrative, Islam freely erases history itself. But Kemalist Turkey appeared to offer a revolutionary break with Islamic tradition when it established a secular republic on the ashes of the Ottoman caliphate. For decades it has been held up as a model of a modern, westernized, Middle Eastern democracy, that happened to have a Muslim majority. Closer examination, however, reveals substantial "continuity between the late Ottoman Empire" and the republic as Turkish treatment of religious and ethnic minorities exposes an unacknowledged streak of Islamic supersessionism. Islamic supersession can be understood in two senses, as replacement and as erasure. Going forward, Islam will supplant all other faiths. But Islam also controls the time before the birth of Muhammad; it claims to have preexisted all other faiths with the Qur'an preexisting all other scripture. Because Islam has always existed, all children are born Muslim although their parents may rear them in another faith. The proof text is in the reported words of Muhammad: "Every child is born according to God's plan; then his parents make him a Jew, a Christian, or a Magian [Zoroastrian]." The claim that Islam has always existed effectively erases all that went before Muhammad. The notion that Islam is the final, true faith, divinely ordained to rule everywhere, has driven Islamic imperialism for 1,400 years. Supersessionist erasure can also be enacted on the landscape. The ancient pagan shrine in Mecca was converted into the Muslim Kaaba. But the Muslim claim is not that monotheism has replaced pagan worship at the Kaaba in the way that a thousand Christian churches were built on pagan altars, but rather that the Kaaba was the "first house" of God (Qur'an 3:96-97) built by Abraham and Ishmael. The Temple Mount in Jerusalem was superseded by the erection of the Dome of the Rock, bolstered by the myth of Muhammad's "Night Journey" to Jerusalem, erasing the pre-Islamic history of the temple and, with it, all Christian and Jewish claims. In later cases, however, sites are incorporated into Islam as symbols of Islamic imperial triumph. So it was when the great cathedral of St. Sophia in Constantinople, originally built in 360, was converted into a mosque by Sultan Mehmet II in 1453. The fact that Christians and Jews continued to live under Muslim rule reinforced Islamic triumphalist beliefs because as "protected people" (or dhimmis), they publicly acknowledged their legal and institutional inferiority to Muslims. But with the rise of European nationalism during the nineteenth century, Islam encountered Christians and eventually Jews who claimed political and religious equality with Muslims and even rights to sovereignty in lands that had hitherto been part of the domain of Islam. Christian or Jewish sovereignty and equality challenge Islamic supersessionism. Nowhere was this clearer than in the Turkish republic. Modern Turkey not only inherited supersessionist attitudes from Islam, it continued the policies of the Ottoman Empire in this regard. Turkic speaking tribes reached Anatolia from Central Asia by the eleventh century, by which time they had already adopted Islam. By the twelfth century, after Anatolia slipped away from Seljuk Turk control, various tribes and strongmen had established principalities that conducted raids or ghaza against infidels and one another in the name of Islam and in search of riches and territory. One of these principalities, founded by Osman I in northwestern Anatolia, would become the core of a dynasty that would last for centuries. The Osmanli or members of the clan of Osman, would become known in Europe as the Ottomans. Though having a variety of legends glorifying Osman himself, Ottoman magnates thought of themselves as Muslims. They adopted the history of the Arab conquests as their own as well as that of popular Arabic epic poems in which Umayyad Arabs defeated Byzantine Greeks in 740. For many Ottomans, the aspirational ancestor was not an Osmanli Turk, but rather, Muhammad, and legal procedures were instituted by the state to certify those claiming the status of sayyid (a descendant of Muhammad). In this sense, the Ottomans were different from the Greek, Roman, and Arab empires that preceded them: There was no ruling ethnic group but rather a ruling elite. Muslims as a whole were constituted as the millet-i hakime, the dominant or ruling people, in relation to the Christians and Jews who were a millet-i mahkume, dominated people born to be governed. The idea that the members of the Muslim millet were members of a great and historic Turkish people was a novelty introduced only in the nineteenth century by Muslim Tatar refugee intellectuals from the Russian conquest of the Ukraine seeking to enhance their status as they created new lives in Istanbul. The business of the polyglot empire was conducted in Ottoman, a Turkic language written in Arabic script with a great deal of vocabulary drawn from Arabic and Persian taught to boys intended for careers in the imperial service. Almost all Muslim boys who went to school attended Qur'an schools where they were taught to recite the Qur'an and prayers in Arabic; a few learned Arabic and continued on to careers in Muslim law. Translations into Turkish from Arabic and Persian existed, but philosophy, mathematics, law, and literature read in Arabic shaped the culture and values of educated Muslims. Even the lowliest Muslim field hand belonged to the dominant, millet-i hakime. The vast majority of the population, however, consisted of peasants of many religions and cultures who spoke local dialects of Turkic, Slavic, and other languages. In order to control and Islamize Anatolia, the Ottoman Empire engaged in an ancient practice of engineering large-scale population movements. The Balkan campaigns of Mehmet the Conqueror, Murad I, and Murad II during the fifteenth century were especially notable for the large Christian communities enslaved and shipped out of the conquered territory. Through conversion and demographic engineering, by the nineteenth century, Anatolia had shifted from overwhelmingly Christian to predominately Muslim although it retained large areas of dense Armenian, Greek, and Syriac Christian settlement, and the Balkans and Aegean islands had strong Christian majorities. New genetic data reveals what has long been known from other sources that the citizens of modern Turkey are overwhelmingly descended from the indigenous Christian peoples. Conversion was usually voluntary although the pressures on subaltern peoples to convert were real. In the traditional phrasing, a Christian or Jew who "surrendered" to the will of Allah was "honored by the glory of Islam." Even the landscape was converted to Islam at the time of conquest with synagogues and churches turned into mosques, including bells removed from church towers transformed into minarets. The conversion of individuals, prisoners of war, slaves, girls acquired as wives or concubines, and entire villages took place in a process of Islamization that continued through the end of the empire. The Greek war of independence, which began in 1821, shook the foundations of Ottoman hegemony less because of the loss of territory than because it turned a religiously-ordered, millenarian world upside down. Islam and empire were supposed to expand forever, and the sultans had inherited the caliphate from the Mamluks of Egypt, along with responsibility for its maintenance. Conquered peoples, millet-i mahkume, were supposed to stay conquered and, ideally, to see the beauty of Islam and convert. Greek independence announced an alternative view of the world, one in which Christians were the equals of Muslims, and Bulgarian, Romanian, Montenegrin, Serb, Armenian, and Jewish peoples claimed the right to self-determination. Where Christians and Jews had been scorned as subservient communities fated to submit to Islam, they were now perceived as an enemy and a threat. To make matters worse, a series of Balkan national liberation movements and victories by the Habsburg, Russian, then French and British empires confronted nineteenth-century Ottoman Muslims with the prospect of living under Christian rule. Muslim legal authorities maintained that Muslims placed in such a situation ought to move to Muslim-governed territory. Many did, especially in the Balkans and Caucusus. The Crimean War (1854-56) alone drove a million Muslims to the shrinking empire. Revolts in Crete, Serbia, and elsewhere added to the flow as the empire revived conquest-era policies, directing Muslim settlers to densely Christian regions of the Armenian highlands and the Balkans. Some 850,000 Muslim settlers were sent to Armenian majority areas between 1878 and 1904. Beyond the displacement—especially frightening for the many Muslim refugees who spoke only Slavic languages—the loss of such enormous territories was inexplicable within the supersessionist paradigm of an Islam chosen by God to expand to the farthest horizons. Resentment over the perceived injustice of loss of empire fueled large scale massacres in the Armenian highlands during the reign of Sultan Abdulhamid, beginning in 1894. War, the crumbling of the empire, concessions forced on remaining Ottoman provinces, internal liberalizing, reforms, all prompted continual rethinking of the empire and its identity. But Islam remained a continuous thread. Muslim intellectuals forwarded pan-Turkism in the late nineteenth century as an answer to the challenge of nationalism. It also arose in parallel with the emerging racial and ethnic concepts of pan-Germanism and pan-Slavism that imagined the superiority and unity of those groups. As Ali Suavi, one of the leading nineteenth-century Young Ottomans, put it, the "Turkish race is superior to and older than all other races." In this scheme, the natural role of the racially pure and superior Turks was to be the ruling nation (millet-i hakime) of the empire. The Turkish race was thousands of years old; its history was a series of world-altering triumphs, culminating in fusion with Islam and the conquest of Anatolia. 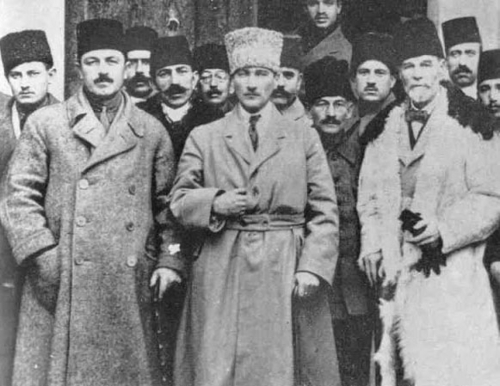 Although the Young Turks and Atatürk (center) are generally viewed as progressives seeking to reform Ottoman society and promote civil rights, they were active in the ethnic cleansing of Armenians and Anatolian Greeks. The Young Turk press bemoaned their loss of prestige, declaring: "How can the Ottomans who once ruled the world become servants to their own shepherds, slaves, and servants." At their most extreme, these ideologues went on to claim that Turks had founded the first great civilization, the one from which all subsequent human civilizations were drawn, including not only Babylonia and Europe, but the Maya, Inca, and Aztec. Turks were entitled to rule because they were the original, indigenous people of Anatolia, one branch of which had left this land, founded Sumer, expanded north into the steppe, converted to Islam, and returned to Anatolia to conquer the Roman Byzantine Empire. This new concept of Turkishness, which transformed a linguistic group into an ethnic and even racial one, was not invented from whole cloth. Turkic tribes including Osmanli Turks did expand out of central Asia in great waves of conquest. Millions of Anatolian peasants were Turkic speakers. Anatolia's Turkic speakers shared a history, a group of Turkic dialects, land that had been their home for centuries, and a religion. The Young Turks proudly took up the name Turk—which had previously been used as a term of scorn to describe illiterate peasants—and turned it into the name of the new nation they were working to invent. All of this followed the pattern of nation creation among Christian peoples in the Balkans so exactly as to be a kind of imitation of the Christian peoples the Ottomans ruled. Balkan Christian nationalists had created new literary languages from spoken dialects, written national histories, and worked to wrest independence from the empire. Turkish nationalism varied from this pattern in that it was the nationalism of a ruling imperial community with its intense supersessionism. Nationalist historians in Greece, Serbia, Bulgaria, and other Ottoman lands wrote triumphalist histories that exaggerated the achievements of their nations, strove to push origins into an improbably ancient past, and painted the Ottomans as brutal conquerors. The Turks went further. They wrote histories in which the Turks were portrayed as having always been in Anatolia with the indigenous Armenian, Syriac, and Greek peoples branded as interlopers. The deepening fusion of Turkish and Muslim identities would prove fateful during the coming decades. Security in the poorly-governed Armenian highlands had long meant living in ethnic or tribal groups capable of self-defense. Farmers could survive only if they lived in villages strong enough to negotiate favorable arrangements with Kurdish tribesmen who collected protection money from farmers in exchange for not raiding them. This system left much of the empire underpopulated, and even though farmers mostly paid, violence was endemic. The channeling of hundreds of thousands of resentful Muslim refugees into the Armenian districts and the spread of modern ideas of self-government led some Armenians to organize themselves as defenders of the nation. Their assumption that the Armenian people had a future only if it could govern itself was accurate, but the nationalists were too few to launch a revolt. The Armenians, however, did muster armed defense of a few towns. Informed estimates of the Armenian dead as a result of massacres ordered by the government and carried out between 1894 and 1896 primarily by Kurdish tribesmen commissioned as paramilitary units range from 80,000 to 300,000. Sultan Abdulhamid's combination of wholesale massacres and directed flows of Muslim immigration meant that by 1896, Muslims were in the majority in the Armenian highlands for the first time in history. There is an extremely black irony here. The Ottoman authorities understood that implementing ethnic cleansing by offering tens of thousands of victims for sale in large, public slave markets—as had been done during the Greek war of independence a few decades earlier—was no longer acceptable. Armenian victims were not dispersed across the empire as slaves; they were killed. The exception, several thousand Armenian children and young girls who were taken into Muslim families as laborers, adopted children, servants, concubines, wives, or some combination thereof, demonstrates that the Armenian massacres were not about race in the eugenic sense; they were about replacing Armenian Christian identity and culture with Islam so as to ensure imperial integrity. The most progressive segment of Ottoman Muslim society was the Committee of Union and Progress (CUP), the group that would become known as the Young Turks. In the 1890s, they were a small elite supporting a program of liberal reform that would offer civil rights to all the people of the empire. The shallowness of CUP liberalism was revealed when the Armenian massacres began. CUP members were not horrified by the massacre of tens of thousands of Ottoman subjects but rather by the idea that some Christians resisted being murdered. At the height of the massacres, the CUP posted placards protesting the "impudent actions" of Armenians who attempted to defend their families. The fear that haunted the CUP was that the Armenians and other Christians would mount wars of national liberation, which appeared to the Muslim elite as Christian efforts to deprive the Ottomans of territory. This nightmare came to life with the First Balkan War of 1912, in which Greece, Bulgaria, Serbia, and Montenegro forced the empire out of its most populous, wealthiest provinces. The Ottoman army was able to hold only Istanbul and its immediate suburbs. Muslims found the loss unimaginable. Enver Pasha, the ambitious minister of war who would play the key role in taking the Ottoman Empire into World War I, asked how Ottomans could bear to let the region fall into the hands of Christians who were "our slaves." In a letter to his wife, he called for "revenge, revenge, revenge; there is no other word." The Young Turk press was appalled by the prospect of a world in which independent states of "Armenia and Kurdistan [will be] our neighbors, and Muscovites our masters. We will become their slaves. Oh! Is it not shameful for us! How can the Ottomans who once ruled the world become servants to their own shepherds, slaves, and servants." The shock was particularly great for the Young Turks, many of whom were Balkan-born sons of the imperial ruling class. The families of Enver and Mustafa Kemal Atatürk were among the 400,000 Muslims who fled their homes. To modern eyes, the Balkan war looks like a tragic but familiar story of the end of empire. But, like other imperialists, the Ottomans had persuaded themselves of their right to rule the land their forbearers had conquered; their sense of grievance was enormous. Having seized power in a 1908 military coup, the Young Turks carried out the ethnic cleansing in the winter and spring of 1914 of Greek Christians from coastal Anatolia, an action ostensibly aimed at precluding the possibility that Greek villagers might assist future invasions. But it was equally a campaign of calculated theft: Greek-owned farms and businesses—many of them substantial—were seized and awarded to Muslims. In modern terms, it was a highly unusual event: a government-sponsored peacetime dispossession and ethnic cleansing of an indigenous people who had not acted against the state. Anatolian Greeks were neither armed nor agitating for unification with Greece when Ottoman militia began to appear in the village squares at midnight, beating loud drums to wake the population. Local officials announced that, within twenty-four hours, they would be unable to guarantee the safety of Christian families. Some 200,000 Greeks fled to nearby Greek islands. The Young Turks felt threatened on almost every side. Some fears were chimerical, as when they persuaded themselves that the large Christian populations of Anatolia would form armed national liberation movements. But other threats, such as the fear of Russian expansionism, were real. From a practical and religious point of view, these developments were unacceptable to the Turks. The modern Turkish republic created itself in two monumental acts of mass dispossession and murder: the Armenian genocide of 1915-16, and the ethnic cleansing of Greeks culminating in 1923. Other nations were founded by migration, conquest, wars of national liberation, wars of self-defense, or acts of gradual consolidation, but Turkey is unique in having been created in an act of genocide. The Ottomans had been content to allow the Christian dhimmis to live as second-class subjects. The Young Turks, however, feared that Christians would claim the right to self-determination and equality with Muslims by forming nation states in their ancient homelands. Although they applied the rhetoric of national self-determination to themselves and were deeply persuaded of their right as Muslims to govern, the Young Turks regarded any suggestion that Christian Ottomans possessed a right to national self-determination as an attack on Muslim rights. They feared that so long as the Armenian, Greek, and Syriac peoples continued to live in Anatolia, they would have a claim to the right of self-determination in their ancient homelands. The Young Turks eliminated this possibility by annihilating the Armenians, annihilating much of the far smaller Syriac community, and using mass murder to drive the Greeks into the sea. Undertaking a genocidal policy of systematic ethnic cleansing on such a huge scale required the participation of tens of thousands of Turkic, Kurdish, and other soldiers, officials, and individuals as willing executioners. It also required the passive participation of a mostly illiterate population, few of whom had been exposed to the ideals of Turkish nationalism. The sole factor that united the soldiers, officials, and civilians who executed the ethnic cleansing was their status as members of the Muslim millet-i hakime and the superior rights that entailed. For the Young Turks, however, the goal was to annihilate the Armenians as a nation and extinguish their language, faith, and culture. To this end, men, women and children were driven from their homes, forced to walk in the endless Syrian desert or killed in other ways. Groups of men were led out of town and shot, some forced to dig their own graves, others herded into buildings and burned to death, or roped together and thrown off cliffs into the Euphrates. Notionally, an Armenian could save his life by accepting Islam. In practice, conversion was forbidden during the genocide for fear that clusters of converts might remain culturally Armenian. Yet the men who commanded the genocide were technocrats who knew that Anatolia was underpopulated. They calculated that the Turkish nation would be strengthened if small numbers of healthy, young Armenians were absorbed into the Turkish people. And they allowed some Armenian families to survive in the expectation that a scattered population could be assimilated. Thus, while most Armenian children were murdered, some were sold. Even as the genocide began, the government planned to add strong, healthy Armenian children and young girls to the Muslim population; the Interior Ministry cabled instructions regarding "the children who are likely to become orphans." Financial inducements were offered for taking an Armenian child into a household and becoming the legal heir of the family property when the child's family was murdered. One could even marry a young Armenian wife and become the legal heir to the property of her dead husband. Well-connected Turks angled to adopt the children of wealthy families or to wed the widows of Armenian landowners. Some officials managed to get several. No government acted to protect the Armenians, but when World War I began in August 1914, Germany demanded that the empire refrain from the ethnic cleansing of Greeks in the hope that Athens would become an ally of the Central Powers, or, at least remain neutral. Accordingly, Minister of the Interior Talat Pasha ordered that Muslims cease "attacks and oppressions" of Greeks. Repeated government orders to this effect were not fully obeyed. Greeks continued to be attacked, murdered, and to have their land and businesses confiscated by powerful Muslims, events the patriarchate recorded with the description, "normal oppressions arose." Centrally-directed ethnic cleansing of Greeks did, however, cease during the first two years of the war, resuming in September 1916 when it became apparent that Greece would enter the war on the Allies' side. Greek villagers were quickly evicted, and Muslims moved in to their empty homes. Supersession as physical replacement of Christians by Muslims was far more efficient under the Young Turks than it had been under the sultans. The war ended with the Young Turk government in disarray, most of its members in flight, the empire shrunken to the borders of modern Turkey with the victorious Allies planning to establish protectorates over much of what remained. Their goal was to internationalize Istanbul and the straits and assign the densely Greek district of Smryna (Izmir) to Greece. The story of the formation of an army and then a government by Mustafa Kemal Atatürk and his victory over the invading foreign forces is well known. The ethnic cleansing of one and a half million Anatolian Greek Christians that followed is less widely remembered than the Armenian genocide because the Greeks had a state willing to give them refuge and citizenship and because most of them were not murdered. After most Anatolian Greeks had been ethnically cleansed, Ankara and Athens negotiated the Treaty of Lausanne in July 1923, which stipulated that all remaining Greek Christians would be required to leave Turkey and all Muslims would leave Greece. The treaty was intended by the Allies to provide some compensation for Greek refugees by enabling at least some of them to move into the homes and farms that would be vacated by the far smaller population of Muslims required to leave Greece. Exemptions were made for the Greek residents of Istanbul and, to maintain parity, the Muslim residents of eastern Thrace. Two small islands, Imbros and Tenedos, were also exempted because of their strategic position at the mouth of the Dardanelles. Turkey undertook to guarantee autonomy to the almost entirely Greek population of the islands. The Turkish military government that took power in 1960 reneged on that agreement replacing the Greek population of the islands with Muslim settlers. Greek-speaking schools were closed in 1964, and the following year, the first mosque with the highly charged name Fatih Camisi (the Conqueror's Mosque) was built on land confiscated from the Greek Orthodox church. The Greek population had supported itself by farming and fishing, but Turkey banned fishing on the pretext of creating an underwater marine reserve. Almost all arable land was expropriated for a large military base and to build an "open prison"; the inmates would live on and work the confiscated farms. With no schools, no land, and even fishing banned, the Greeks, preyed on by Turkish convicts, left. Turkey replaced a Christian population with Muslims by a series of administrative maneuvers. Men who drew on eugenic race theory to construct and privilege a Turkish master race dominated Turkish politics from the 1920s through the 1940s. Racism was a comfortable theory for men and women who had grown up thinking of Muslims as the millet-i hakime. As Atatürk explained in 1923, "Armenians have no rights at all in this prosperous country. The land is yours; the land belongs to the Turks. In history this land was Turkish, therefore, it is Turkish and will remain Turkish forever. The land has finally been returned to its rightful owners. The Armenians and the others have no rights here at all. These blessed regions are the native lands of the true Turks." During a Kurdish uprising in 1930, Mahmut Esat, a close associate of Atatürk, echoed this: "All friends, enemies, and the mountains shall know that the Turk is master of this country. All those who are not pure Turks have only one right in the Turkish homeland: the right to be servants, the right to be slaves." The plight of the Turkish Donme illustrates the racism that gripped Turkish ideologues at the time. The Donme originated as Jewish followers of a false messiah named Shabbatai Tzevi who converted to Islam in 1666. Like many groups of Ottoman converts to Islam, the Donme were largely endogamous and retained many pre-conversion customs until the late nineteenth century when they welcomed modern, secular culture more eagerly than any people in the empire. By the 1880s, the Donme, most of whom lived in Salonika, ran some of the finest secular schools in Ottoman lands, including one that Atatürk attended. They were also among the intellectual leaders of Turkish nationalism. Like other Muslims, they were expelled from Salonica under the terms of Lausanne; most moved to Istanbul where they assimilated into Turkish society. But in the 1920s, a frenzy of hatred was unleashed against the Donme by Turkish leaders. They made use of the newly fashionable language of race, accusing them of being of non-Turkish blood. As the 1934 Turkish settlement law no. 2510 put it, "Unity in language, culture, and blood." Under the wealth tax of 1942, a tax aimed at driving non-Muslims out of Turkey by imposing taxes exceeding the value of their property, the Donme—Muslims of three centuries deeply committed to the republic—were classified as Jews. Muslim supersessionism—in the form of radical nationalism where the Turkish "race" and Islamic hegemony were effectively identical—was transferred to the republic with a new goal of replacing all non-Turkish languages, cultures, and identities. While the republic directed its efforts toward remaking the Kurds, Alevis, and other non-Turkish Muslims into Turks, the erasing of non-Muslim history and populations continued. In describing Turkey in 2012 as "one nation, one state, one flag, and one religion," Prime Minister Recep Tayyip Erdoğan expressed an enduring Turkish aspiration. The settlement law of 1934 was designed to "create a country speaking with one language, thinking in the same way, and sharing the same sentiment," said Şükrü Kaya, minister of the Interior. It privileged persons of "Turkish culture," defined as Turkish-speaking Muslims and most Ottoman Muslims of every tongue who had fled into the empire, but not Kurds or non-Muslims. Kurds were also targeted for forced resettlement among Turkic speakers with the replacement of Kurdish culture as the goal, as were Alevis, Roma, Circassians, and other Muslim minority groups in Turkey. The 1934 settlement law also defined a series of "type one" zones along borders, railroad lines, and other areas regarded as security concerns. Residence in these zones was restricted to persons of "Turkish culture." Settlers from this privileged category were given land and property taken from Kurds and non-Muslims. It was under this law that the 1934 ethnic cleansing of the Jews of eastern Thrace was carried out. A far larger event was the Turkish takeover of the old Ottoman sanjak of Alexandretta, part of French Mandatory Syria. Ankara falsely claimed that the province was a majority Turkish area. Perhaps 40 percent of the population of the ethnically-mixed coastal province was Turkish. Nevertheless, the French and Turks colluded to produce a census "proving" the Turkishness of the province. Paris then allowed Ankara to rig a plebiscite that awarded the province to Turkey under the rubric of self-determination for a Turkish-majority area. Some 80 percent of the province's Christians and many of its Arabs fled. Ankara then imposed Turkish language and culture on the polyglot Muslim population that remained. On September 6-7, 1955, the government of Turkey moved to cleanse Istanbul of its remaining Christians and Jews, including the 100,000 Greeks whose right to live in the city was guaranteed by the Treaty of Lausanne. Little was looted but ancient communities were destroyed. Although often associated with the Cyprus dispute, historian Dilek Güven argues persuasively that the government-organized riot is best understood as part of a policy of forcible Turkification. Houses and businesses owned by Armenians, Greeks, and Jews were identified, wire cutters, sledge hammers, welding machines, and other tools distributed, and on the assigned date, 100,000 rioters broke into non-Muslim homes and businesses destroying industrial equipment, personal property, and commercial goods while Christian and Jewish families huddled in terror. Many women were raped, and a dozen Christians were killed. The non-Muslim past was erased by rioters who smashed icons, burned churches, and broke into the Greek cemeteries of Şişli and Balıklı, opening the tombs and destroying the bones. This peacetime, government-sponsored ethnic cleansing in a modern, ostensibly democratic, country was a remarkable event, and not only because the Turkish government acted in violation of treaty obligations. Greece has not expelled the Muslim minority it retained under the Treaty of Lausanne and neighboring Bulgaria retains a large Muslim minority. Most nation states have large confessional minorities. But the Republic of Turkey has acted repeatedly and deliberately to expel Christians and Jews. The same approach was applied to Cyprus. The Ottomans conquered the island in 1570 and began moving Muslim settlers onto it in their usual manner, an effort that ended with the Battle of Lepanto a year later. In the wake of that defeat, the most the empire could manage was to appoint a Greek archbishop to govern the island's overwhelmingly Greek population. Cyprus would be poor, backward, and overwhelmingly Greek until ceded to Britain in 1878. The island prospered under British control, attracting significant Turkish immigration for the first time. It was never governed by the republic, which renounced all claims in the Treaty of Lausanne. After World War II, the island's Greeks demanded that the British leave and enable unification with Greece. Britain, enmeshed in the Cold War, opted instead to please Turkey by creating an independent Cypriot State in 1960 with a complex binational constitution in which roughly 100,000 ethnic Turks shared power with about 500,000 Greeks. Britain, Turkey, and Greece retained the right to intervene to protect "the integrity, sovereignty, territorial integrity, and independence" of the new state. Intercommunal violence escalated. On July 20, 1974, Turkey invaded. Whether Turkey had a treaty right to land troops to protect the binational state from Greek militants is a moot question, but the morphing of the invasion into permanent occupation was an act of pure imperialism. Turkey conquered more than a third of the island, forcing Greeks to flee. It quickly moved tens of thousands of Turkish settlers into the farms and homes of Greek Christian families. The majority of the Turkish population of Northern Cyprus is now comprised of post-1974 settlers and their families. Atatürk and his followers worked to create what was outwardly a secular, Turkish republic. Islamic law was disestablished, the Arabic alphabet abandoned, Sufi religious orders outlawed, Islam phased out of the public schools, and the Muslim head scarf banished from government schools and offices. The secular Turkish republic also took steps with respect to the landscape, most notably the transformation of Hagia Sophia in Istanbul from a mosque into a museum. But the conjoined Turkification and Islamization were pervasive throughout the twentieth century. Turkey erases history by inventing new names and imposing them on mountains, towns, and families. Although Constantinople, Smyrna, and some other places had Ottoman names, the old Greek names continued in common use even by Ottoman officials. The first campaign to erase history from the map began in 1915. The Armenian genocide was underway when Enver Pasha announced that it was a "suitable moment" to replace the Armenian, Greek, and Bulgarian names of "provinces, districts, towns, villages, mountains and rivers" with new, Turkish names. However, changing the names of towns on maps in the midst of a large-scale genocide confused the movement of troops and populations, so the idea was dropped. A new effort to purify the map began in 1922, carried forward by fits and starts over the course of decades in conjunction with the efforts to purge the newly-invented Turkish language of Persian, Arabic, and Greek words. Learned societies and government departments carried out the work of "Turkifying" the map. Place names of Kurdish, Syriac, Arabic, Georgian, Laz, Armenian, and Greek origin were replaced by Turkish names even as these cultures had been or were slated to be superseded by Turkish culture. After the 1974 conquest, the new Turkish government of Northern Cyprus rapidly renamed all of the Greek place names as part of its "eradication of Greekness." The surname law of 1934 extended this Turkish-Islamic imperial approach to families themselves by requiring that, within two years, every citizen of Turkey had to have a Turkish surname. It did not operate with perfect efficiency, especially in the Kurdish region, but it did mean that individuals whose surnames indicated the family's Christian, Jewish, or non-Turkic origin acquired Turkish surnames. For many, this was a boon, an opportunity to enter the Turkish mainstream, although in everyday life, Turks often detect Turkified names of non-Muslim citizens and regard the members of minority groups they identify in this way as foreigners. There are several plotlines that the authors of a national history can follow. They can claim as the English do to have emerged from a blend of peoples and cultures in a series of formative events. They can claim as the ancient Athenians did that they have always been where they are now, a people born of the land. Or they can claim, as the Hungarian, Slavic, Hindu, and American nations do, to have been founded by men who came from elsewhere. Virgil made this claim for the Romans, writing in the Aeneid about Rome's noble founding father Aeneas who came from Troy in Anatolia. The narrative of conquerors from afar has a long and powerful history. The reasons why Turks reject it are interesting since, after all, it has the advantage of being true. Instead of using this potent narrative, Turkishness was created as a nominally secular, racially-oriented version of Islamic replacement theology. In the face of overwhelming evidence to the contrary, Turkish nationalists have spent a long century staking a secularist claim that Turks are the original people of Anatolia and that Muslim and Turkish identity are inseparable. But Turkey has never been the secular, democratic nation-state that the Young Turks and Kemalists claimed to be building. In part, this is because both Young Turks and Kemalists equated true Turkishness with being Muslim. Despite having written the school curriculums and often controlled the press for four generations, Turkish nationalists have never persuaded the people of Turkey to become secular Turkish nationalists. Forty-nine percent of Turkish citizens responded to a 2011 poll by claiming that they regarded Islam as their primary identity; only 21 percent thought that their Turkish nationality was primary. Another failure of Turkish nationalism stems from the wholesale transference of the old Islamic paradigm of supersessionism to Turkish nationalism: Turks expected all non-Turkish Muslims to wish to become Turks. Since its foundation in 1923, Turkey has repeatedly enacted in policy, military conquest, and law the supersessionist conviction that as Muslims and Turks, the citizens of the republic were endowed with special rights to expand their territory by any means available, forcibly assimilate conquered peoples, eliminate non-Muslim populations, and erase pre-Muslim history. It is important to understand that there was a path not taken. Turks could have formed a nation-state alongside Armenian, Greek, Kurdish, and Syriac nation-states. That would have been an act of banal nationalism. Instead, the Young Turks and Atatürk, unable to escape the grip of Islamic theology, failed to imagine that other peoples might have rights equal to those of Turks. And so it continues. Diana Muir Appelbaum is the author of Reflections in Bullough's Pond: Economy and Ecosystem in New England (University Press of New England, 2000). Erik J. Zürcher, The Young Turk Legacy and Nation Building: From the Ottoman Empire to Atatürk's Turkey (New York: I. B. Tauris, 2010), p. ix. Bernard Lewis, The Political Language of Islam (Chicago: University of Chicago Press, 1988), p. 152, n. 8. See Efraim Karsh, Islamic Imperialism: A History (New Haven: Yale University Press, 2006). William J. Hamblin, "The Temple in the Qur'an," paper presented, Dublin, July 3, 2012. Ruya Kilic, "Sayyids and Sharifs in the Ottoman State: On the Borders of the True and the False," Muslim World, Jan. 2006, pp. 21-35. Jacob Landau, Pan-Turkism: From Irredentism to Cooperation (Bloomington: Indiana University Press, 1995), pp. 7-73. Doğan Gürpınar, "Anatolia's eternal destiny was sealed: Seljuks of Rum in the Turkish national(ist) imagination from the late Ottoman Empire to the Republican era," European Journal of Turkish Studies, May 22, 2012; Nesim S. Eker, "Demographic Engineering in the Late Ottoman Empire and the Armenians," Middle Eastern Studies, May 2007, pp. 461-74. Uğur Hodoğlugil and Robert W. Mahley, "Turkish Population Structure and Genetic Ancestry Reveal Relatedness among Eurasian Populations," Annals of Human Genetics, Mar. 2012, pp. 128–41. Marc David Baer, Honored by the Glory of Islam: Conversion and Conquest in Ottoman Europe (Oxford: Oxford University Press, 2008), pp. 13-8, 81-104, 185-203, 138-40, 148, 160-1; Tijana Krstic, "Illuminated by the Light of Islam and the Glory of the Ottoman Sultanate: Self-Narratives of Conversion to Islam in the Age of Confessionalization," Comparative Studies in Society and History, Jan. 2009, pp. 35-63. Taner Akçam, From Empire to Republic; Turkish Nationalism and the Armenian Genocide (London: Zoryam Institute, 2004), p. 93. Gürpınar, "Anatolia's eternal destiny was sealed." Uriel Heyd, Foundations of Turkish Nationalism: The Life and Teachings of Ziya Golkalp (London: Luzac 1950), p. 112. Soner Çağaptay, "Reconfiguring the Turkish Nation in the 1930s," Nationalism and Ethnic Politics, Summer 2002, pp. 67-82. Uğur Ümit Üngör, The Making of Modern Turkey: Nation and State in Eastern Anatolia, 1913-1950 (Oxford: Oxford University Press, 2011), p. 19. Taner Akçam, A Shameful Act: The Armenian Genocide and the Question of Turkish Responsibility (New York: Holt, 2006), p. 60. Üngör, The Making of Modern Turkey, pp. 45-6. Erik-Jan Zürcher, "Greek and Turkish Refugees and Deportees 1912-1924," Turkology Update, Leiden Project Working Papers Archive, Dept. of Turkish Studies, Universiteit Leiden, Jan. 2003. Üngör, The Making of Modern Turkey, p. 36. Taner Akçam, The Young Turks' Crime against Humanity: The Armenian Genocide and Ethnic Cleansing in the Ottoman Empire (Princeton: Princeton University Press, 2012), p. 291. Andreas Gross, "Gökçeada (Imbros) and Bozcaada (Tenedos): preserving the bicultural character of the two Turkish islands as a model for co-operation between Turkey and Greece in the interest of the people concerned," Committee on Legal Affairs and Human Rights, Council of Europe, Parliamentary Assembly, Strasbourg Cedex, June 6, 2008. Marc David Baer, The Donme; Jewish Converts, Muslim Revolutionaries, and Secular Turks (Palo Alto: Stanford University Press, 2010), p. 188. Erol Ülker, "Assimilation, Security and Geographical Nationalization in Interwar Turkey: The Settlement Law of 1934," European Journal of Turkish Studies, 7 (2008). Hürriyet (Ankara), May 9, 2012. Ülker, "The Settlement Law of 1934." Sarah D. Shields, Fezzes in the River: Identity Politics and European Diplomacy in the Middle East on the Eve of World War II (Oxford: Oxford University Press, 2011), pp. 176-231. Dilek Güven, "Riots against the Non-Muslims of Turkey: 6/7 September 1955 in the context of demographic engineering," European Journal of Turkish Studies, 12 (2011). Kerem Öktem, "The Nation's Imprint: Demographic Engineering and the Change of Toponymes in Republican Turkey," European Journal of Turkish Studies, 7 (2008). Sarah Ladbury and Russell King, "Settlement Renaming in Turkish Cyprus," Geography, Oct. 1988. Marcy Brink-Danan, "Names That Show Time: Turkish Jews as 'Strangers' and the Semiotics of Reclassification," American Anthropologist, Sept. 2010, pp. 384–36. "Muslim-Western Tensions Persist," Pew Global Attitudes Project, Washington, D.C., July 21, 2011. Related Topics: History, Turkey and Turks | Winter 2013 MEQ receive the latest by email: subscribe to the free mef mailing list This text may be reposted or forwarded so long as it is presented as an integral whole with complete and accurate information provided about its author, date, place of publication, and original URL.